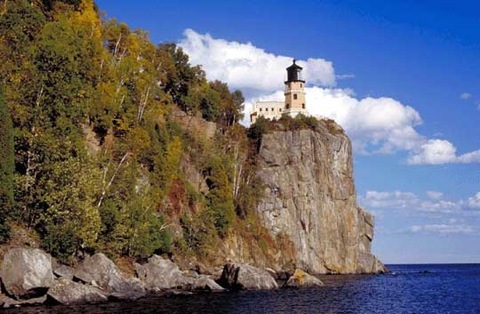 Split Rock Lighthouse is still one of the most remote lighthouses of the Great Lakes region, about 50 miles north along Lake Superior’s coastline from Duluth, Minnesota. It’s certainly the tallest and one of the most dramatic looking, with its rocky perch on a high cliff overlooking Lake Superior. Commerce on the lakes had increased greatly by the turn of the century. Iron ore from Minnesota’s mines was sent to Duluth and loaded onto the U.S. Steel Company’s large fleet of ships, which then carried the product over Lake Superior and through the Soo Locks down to Lake Huron, Lake Erie and on to Pittsburgh. But the rocky north shore of Lake Superior plays havoc with compass navigation due to the large deposits of iron. Combine this with three devastating 1905 winter storms, including one November gale which wrecked nearly 30 ships on Lake Superior. 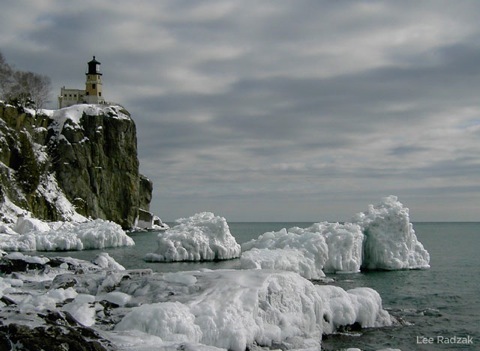 The need for a lighthouse at Split Rock took shape soon after. But it wasn’t easy building the structure. First, a steam hoist had to be hauled by lines and tackle attached to nearby trees up 130 feet to the cliff’s top and then secured to the rock, which was actually known as Stony Point. The 12,000 pound hoist then lifted the other building materials (and workers too) from ships on the lake below using a ‘skip’ or box crate. Split Rock Lighthouse is octagonal in shape with a steel frame and yellow brick, set on a concrete foundation into the rock. 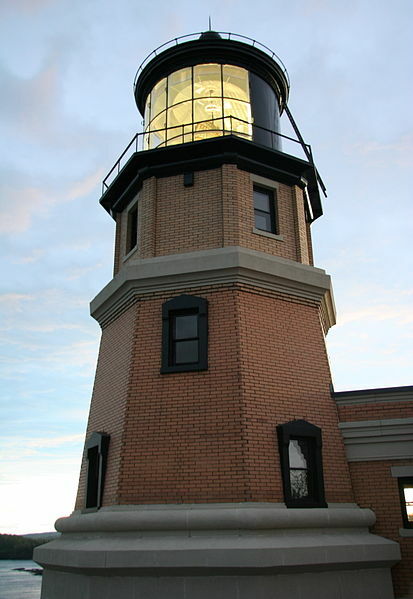 The 54-foot tower is topped with a steel lantern and originally fitted for a second-order Fresnel lens. 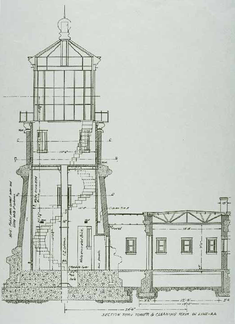 However, due to the construction budget overrun, a third-order Fresnel lens was installed. It rotated by a clockwork mechanism powered by weights that hung down the tower’s center and was wound by a crank at the top. The oil vapor lamp inside burned kerosene. The project began in May of 1909 and continued through November, then finished up the following spring. A row of three keeper’s dwellings were identical, each with their own cellar containing a water cistern, the first floor with a hall, living and dining room plus kitchen, and three bedrooms and a bath on the second floor. A long wooden stairway hugged the rock face and led to a rocky beach west of the station, where a pier and boathouse provided storage. The keepers used rowboats for transporting supplies or fishing trips. Also, a concrete oil storage building was built further from the station to store the kerosene fuel. In midsummer of 1910, the station’s keeper, Orrin “Pete” Young, took residence at last. The light first glowed on July 31st of that summer. But tragedy struck in October when his two assistant keepers sailed to Beaver Bay for mail but drowned and the bodies never recovered. The First Assistant, who had just begun his career for the USLHS that spring, left a pregnant widow and young child. Young served until 1928 when Franklin Covell took over. Covell served until 1944 and retired at 70 years old, the mandatory age. He and his assistant once turned the Fresnel lens by hand over a two-night period. They bought eight pounds of mercury to fix the problem, but instead of being thanked or receiving praise, Covell’s superiors in Detroit forced him to justify the expense! Keepers also had to deal with tourists during the day as well as handling their regular day duties and lighting duties at night. By 1916, supplies for the station could be transported by a tramway from the lakeshore. And a road was finally built in 1924 to make it less isolated. Lightning actually hit the tall tower in 1932. A fog signal was installed in a building adjacent to the tower, with a pair of sirens driven by gasoline-powered air compressors. In 1932, diesel engines replaced the gasoline. Then in 1936, a diaphone signal replaced the steam sirens until electricity came four years later. The fog signal was no longer used after 1961. 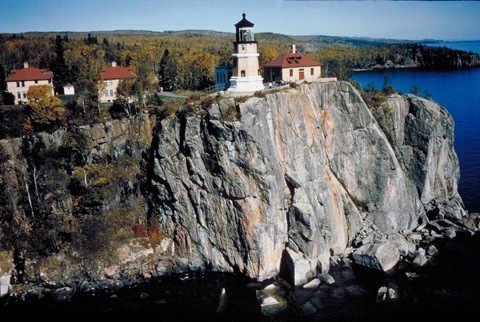 The Coast Guard took over Split Rock lighthouse in 1940, when it had built a reputation for being the most visited station in the United States. The light wasn’t deactivated until 1969. Now the Minnesota Historical Society has restored the lighthouse to reflect its appearance in the 1920s. Each November on the 10th, the lamps glow in memory of the Edmund Fitzgerald which passed by Split Rock toward its fateful end in 1975. A memorial takes place where the names of the 29 sailors who perished are read, along with night visits to the tower. Whitefish Point and Duluth also conduct memorials. The historic site is located at 3713 Split Rock Lighthouse Road, Two Harbors, Minnesota, which is part of the Split Rock Lighthouse State Park.